Anti-Malware Is Necessary In The Data Center: 3 Examples - Symtrex Inc. Simply because data center endpoints don’t have the same threat profile as general desktops doesn’t mean they don’t need anti-malware software. Here’s why. People often ask about the value of anti-malware software on data center endpoints such as Web servers, databases, file servers – the list goes on. This is a reasonable question because, with respect to malware, data center endpoints simply don’t have the same threat profile or business use-cases as general desktops, where users click on things all day, every day. Also, when endpoints don’t have all those pesky users, it would seem malware would have a much harder time getting onto data center endpoints. Yet, it happens all the time. How? Before providing the best practices for a successful data center relocation, a security guidance is required. I would first like to share the most common attack patterns seen in the wild, and recommendations backed up by data. For this, I rummaged through the Verizon Data Breach Investigations Report (DBIR) 2016, which combines knowledge from more than 3,000 confirmed data breaches, and has a lot to say about malware usage. The figure below, from the DBIR, presents an insightful attack pattern. What’s happening is, through a variety of extremely common techniques, such as phishing and others, a user’s desktop is compromised and infected with malware. While the data on this particular compromised endpoint may not be of high value, the malware is used to harvest static credentials (user names and passwords) just the same. The next step in the breach is often to leverage the stolen credentials to pivot across the network, logging into point-of-sale systems, databases, Web servers, and file servers — where the real crown jewels are located — and infecting them with malware for command and control, and data exfiltration purposes. 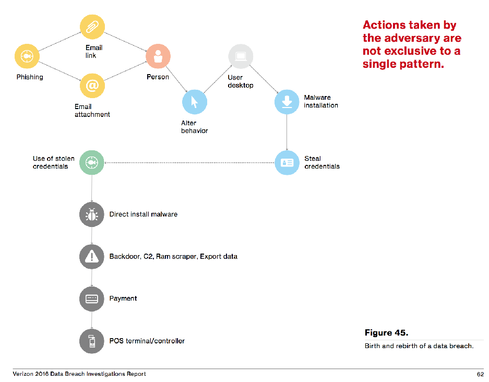 Since the threat actor is using valid credentials to access these data center endpoints, and not exploits, intrusion detection alarm bells are less likely to be triggered. So, in this case, if anti-malware software had been installed on these endpoints, that’s one more effective security control a threat actor would have had to bypass in order to obtain what they were after. Another topic the Verizon DBIR discusses is “secondary motives.” For example, threat actors will compromise Web servers in the data center, often through exploiting SQL Injection or a PHP Remote File Include, and implant malware on the endpoint. The malware will typically have a couple of common purposes separate from data exfiltration. One purpose is what’s referred to as a watering hole attack. The threat actor selects a certain website to compromise and serves up malware to a particular set of users – their primary targets – who are likely to visit the website. Another purpose is for the malware to launch spam campaigns or DDoS attacks on more primary targets. Websites often have far more computing resources and bandwidth at their disposal than a typical user PC, which makes them attractive targets. Again, if sufficient anti-malware technology had been installed on Web servers, it would have made it that much harder for the bad guys to establish a foothold, even though they successfully exploited a vulnerability. – Also read: Decommissioning An Outdated Server With Professional Help. These examples show how important anti-malware software would have been in protecting against these unwarranted attacks. When reviewing common attack patterns, anti-malware software absolutely has value in the data center. With the introduction of new, signature-free next-generation approaches that use machine learning and dynamic behavior tracking, organizations can deploy this technology in a minimally invasive manner. This is crucial to understand. As the Verizon DBIR also said, and the figure above illustrates, “99% of malware hashes are seen for only 58 seconds or less.” If we can disrupt the way adversaries generally conduct their operations, we can make the biggest impact in protecting our systems.